I think I might be defective. My phone has this feature called “Smart Stay”. 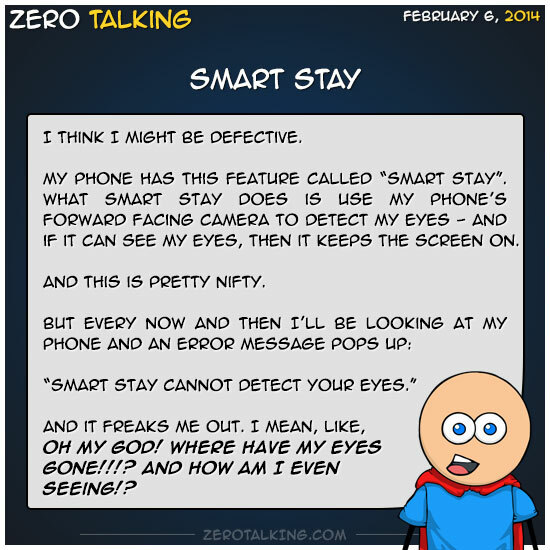 What Smart Stay does is use my phone’s forward facing camera to detect my eyes — and if it can see my eyes, then it keeps the screen on. And this is pretty nifty. And it freaks me out. I mean, like, OH MY GOD! WHERE HAVE MY EYES GONE!!!? And HOW am I even seeing!? It’s at times like this I’m afraid to look in the mirror out of fear I’ll see my face staring back at me and it won’t have any eyes!